Frame: Powder Coated Aluminum. 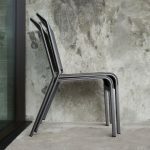 Seat & Back: Polyvinyl Mesh. Stacks to 3.